"Ridiculously easy but will impress your taste buds! 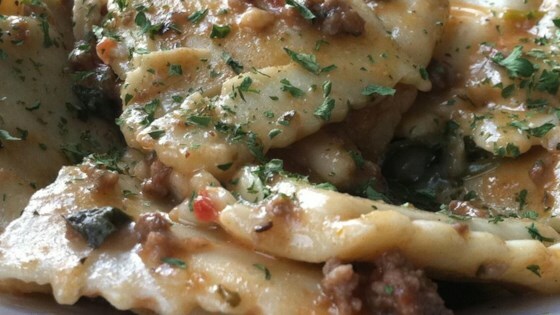 This dish turns ordinary frozen ravioli into a culinary delight!" Preheat oven to 450 degrees F (230 degrees C). Grease a 2-quart casserole dish. Cook and stir ground beef in a skillet over medium heat until the meat is browned and crumbly, 8 to 10 minutes; stir in garlic and cook just until fragrant, about 1 minute. Pour in diced tomatoes and mix in Italian seasoning and salt. Reduce heat to low and cook at a simmer, stirring occasionally, while you complete remaining steps. Bring a large pot of water to a boil, stir in frozen ravioli, and reduce heat to medium. Cook ravioli until tender, 6 to 7 minutes. Drain. Place half the ravioli into the bottom of the prepared baking dish and cover with layers of half the spinach, half the ground beef sauce, half the mozzarella cheese, half the Cheddar cheese, and 1 tablespoon shredded Parmesan cheese. Repeat layers once more and sprinkle top with remaining 1 tablespoon Parmesan cheese. Cover dish with foil. Bake in preheated oven until casserole is bubbling and cheese has melted, about 20 minutes. perfect and delicious quick meal, even for picky eaters! Made this last night and thought it was delish! I had read previous reviews so I didn't add salt and substituted italian sausage for ground beef. Hubby loved it-will make again! This was a quick and easy weeknight dinner. It's not something I would serve to company, but it's definitely good comfort food when you're short on time and ingredients.